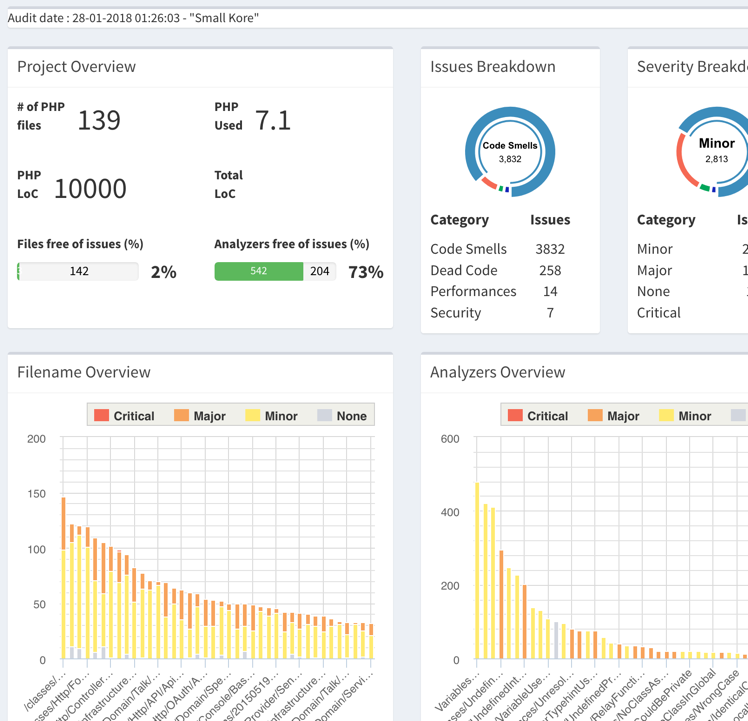 There are currently 351 different analyzers that check the PHP code to report code smells. Analyzers are inspired by PHP manual, migration documents, community good practices, computer science or simple logic. Some of them track rare occurrences, and some are frequent. Some track careless mistakes and some are highly complex situations. In any case, exakat has your back, and will warn you. 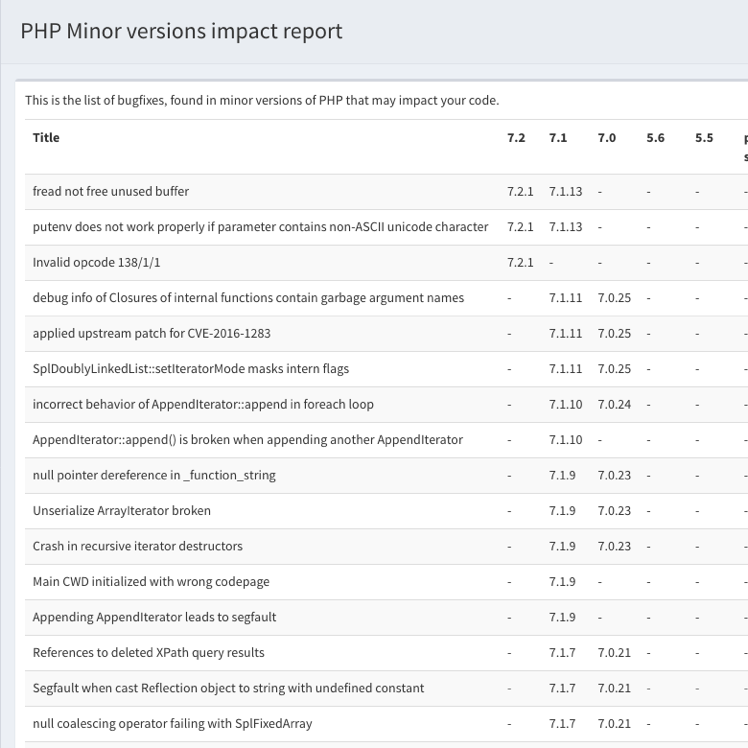 The Exakat engine audits code with PHP versions that range from PHP 5.2 to PHP 7.4-dev. The Exakat engine itself runs on PHP 7.x+ and is regularly checked on those versions. It is possible to run Exakat on 7.2 and audit a code with PHP 5.6. Every middle version of PHP comes with its migration guide from the manual, and from community’s feedback. Incompatibilities are included as analyzers in Exakat, and report everything they can find that may prevent you from moving to the newer version. Although they won’t catch it all, they do reduce the amount of unexpected surprises by a lot. Migrations are too often considered over when incompatibilities are removed. In fact, the best is still to come : using the new features. Or, using the new features from previous versions, that were forgotten. Exakat dedicates a whole category of suggestions to modern PHP features that should be used now. 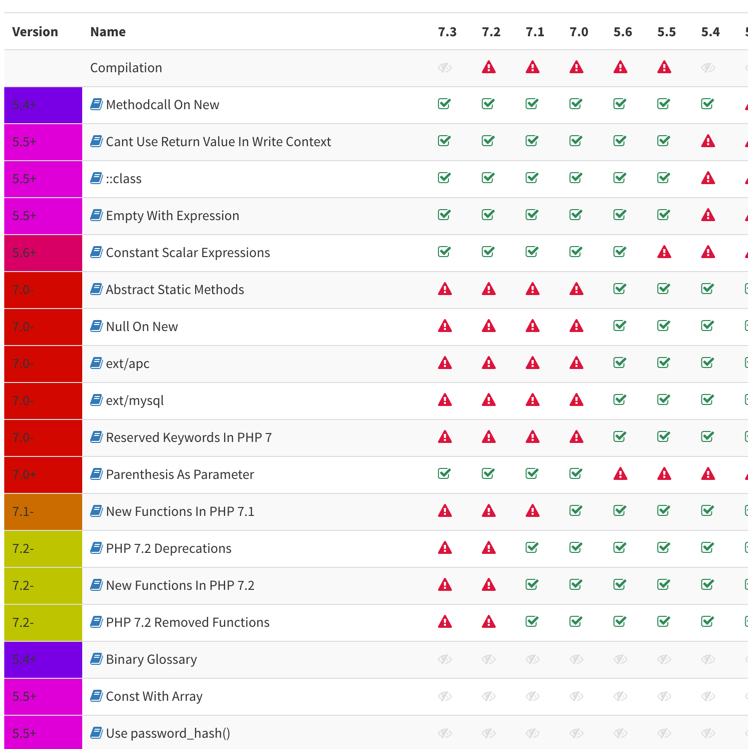 Every minor version of PHP comes with bug fixes and modifications at the function level. Some special situations are better handled, and that may have impact in your code. 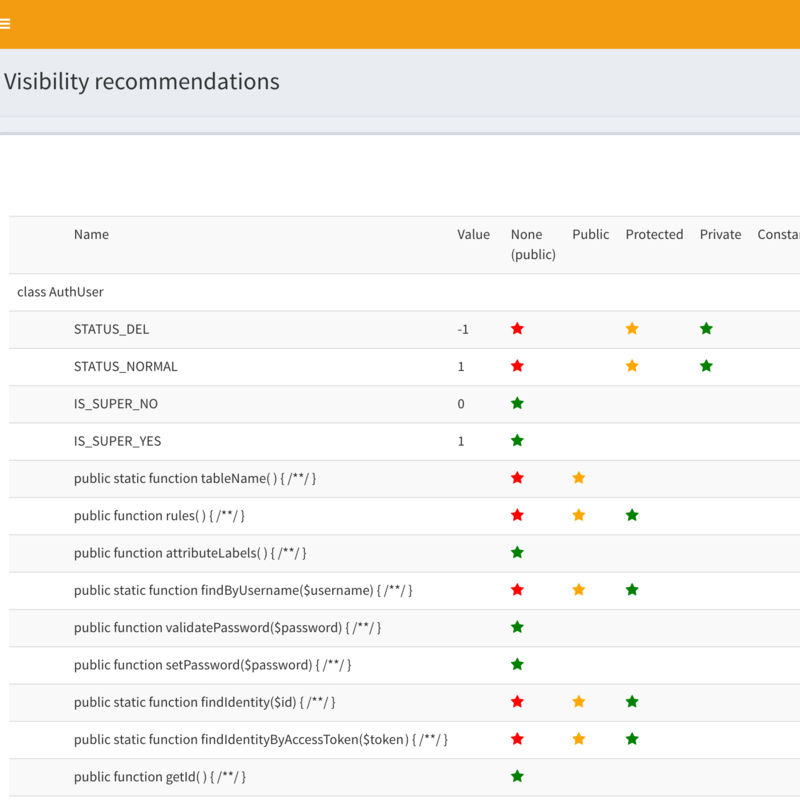 Every modified function, class, trait or interface that is also found in your code is reported here, giving a good overview of the impact of every minor version. Safe bet : keep up to date! Do you know the PHP features that your application rely upon ? Recursivité, reflexion, backticks or anonymous classes ? Exakat collect all those features, and sum them up in one nice table, so you know all of it. 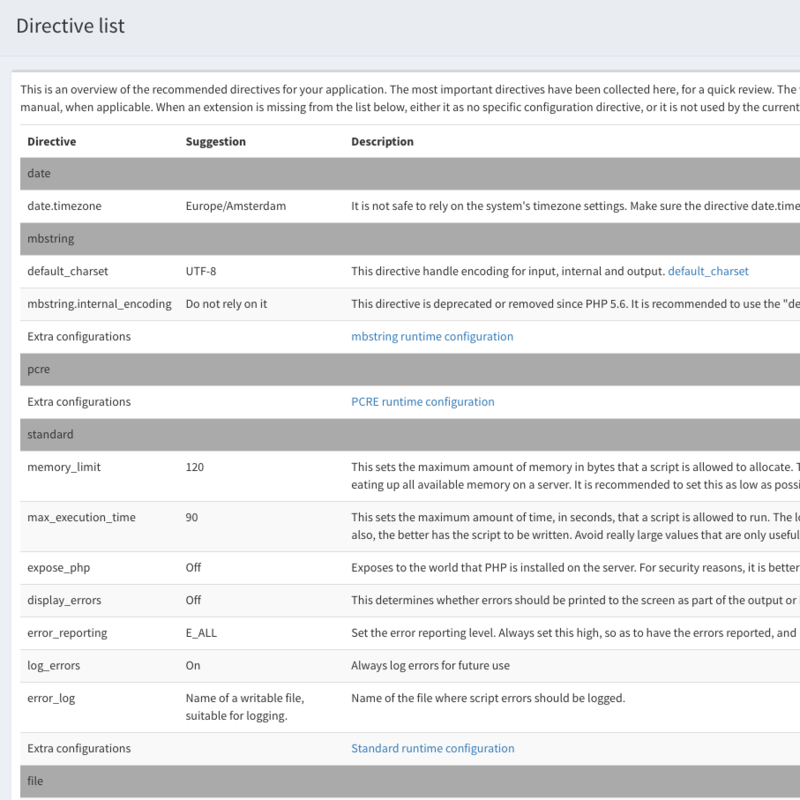 Exakat recommends which PHP directives to check while preparing your code for production. 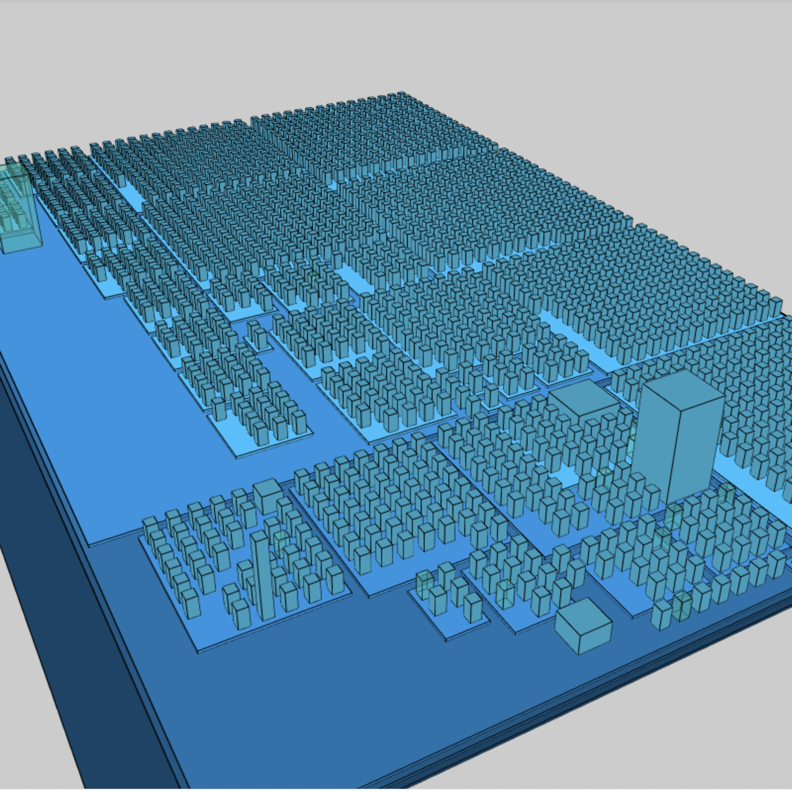 If ‘memory_limit’ is an ever green, may be ‘post_max_size’ (linked to file_upload), or assertions shouldn’t be forgotten. 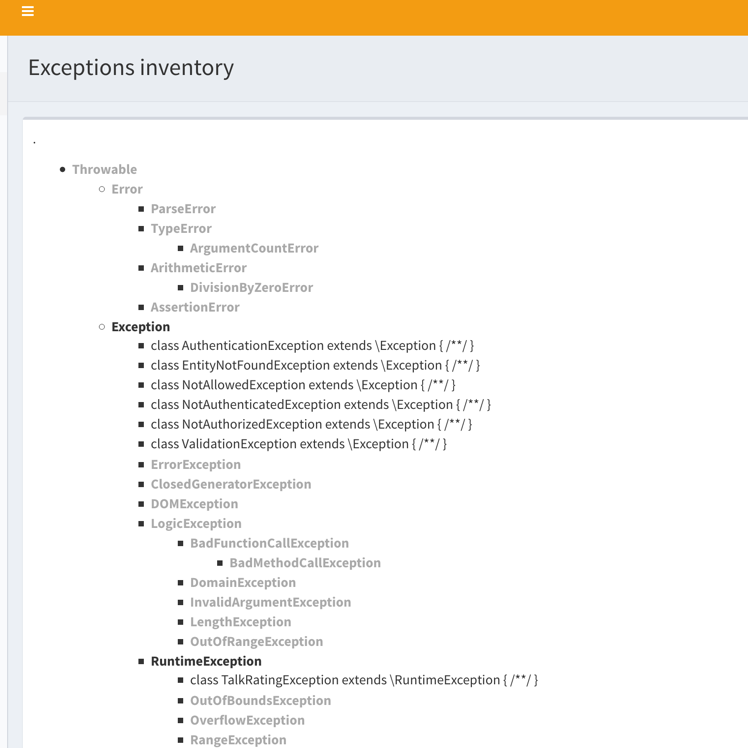 Based on feature and extension usage, it also list the most important directives, and leads you to the full manual list, in case you want to fine tune it to the max. Use it as a reminder. Exakat documents the code automatically with several diagrams, such as : a full UML class diagramm, based on inheritance (classes), usage (traits) and implementations (interfaces), grouped by namespaces.